Roald Dahl’s timeless story of the world-famous candy man and his quest to find an heir comes to life in this stage adaptation of Charlie and the Chocolate Factory, which features the songs from the classic family film. 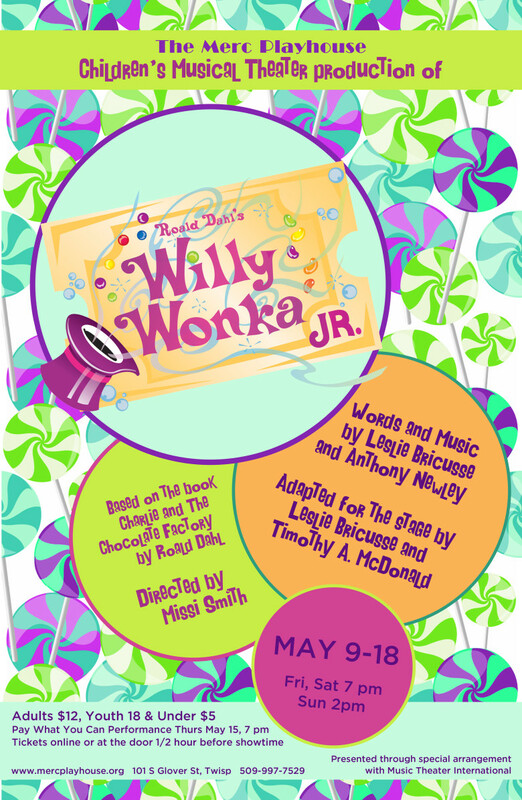 The story follows enigmatic candy manufacturer Willy Wonka as he stages a contest by hiding five golden tickets in five of his scrumptious candy bars. Whoever comes up with these tickets will win a free tour of the Wonka factory, as well as a lifetime supply of candy. Four of the five winning children are insufferable brats: the fifth is a likeable young lad named Charlie Bucket who takes the tour in the company of his equally amiable grandfather. The children must learn to follow Mr. Wonka’s rules in the factory–or suffer the consequences. Directed by Missi Smith and featuring set pieces built by the Liberty Bell High School construction and welding classes. Sponsored by the Winthrop Kiwanis and Sheri’s Sweet Shoppe. DATES: May 9-18, 7pm, Sundays, 2pm. Adults/$12, Youth/$5 (18 & under). “Pay What You Can” Thurs, May 15, 7pm. LOCATION: The Merc Playhouse, 101 S. Glover St. Twisp, WA; 509.997.PLAY (7529); www.mercplayhouse.org.